(New Britain, Conn., Aug. 31, 2017) – New Britain native and Houston Astros All-Star outfielder George Springer is partnering with local businesses in Central Connecticut to support relief efforts for the Houston area in the wake of Hurricane Harvey. 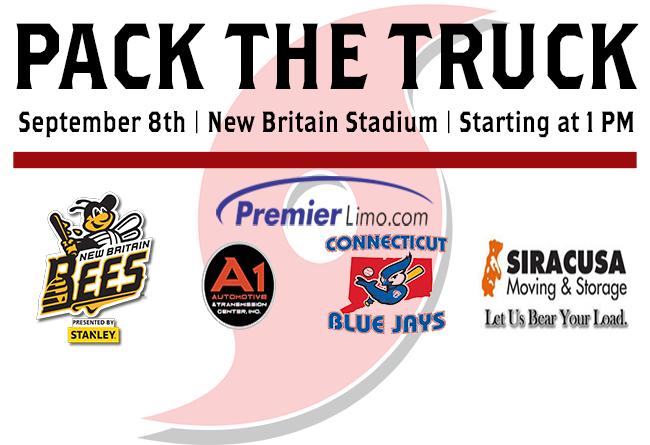 On September 8th, the New Britain Bees, Siracusa Moving and Storage, and Premier Limousine will hold a Pack the Truck event at New Britain Stadium starting at 1 PM to collect donated items for those impacted by the storm. The Bees will host the Sugar Land (Texas) Skeeters that night for a doubleheader starting at 5:35 PM. As part of the Pack the Truck, the Bees, Siracusa Moving & Storage, and Premier Limousine are seeking donated items including nonperishable food, lightly used clothing, unopened personal hygiene products, household items (including air mattresses, but not including furniture) and baby products. A complete list of requested donations is attached to this release. Donations will be accepted starting September 5th at New Britain Stadium (230 John Karbonic Way, New Britain) as well as Siracusa Moving & Storage (250 Commerce Circle, New Britain) and Premier Limousine (76 Fuller Way, Berlin). Local organizations partnering in the donation efforts include A1 Automotive and the Connecticut Blue Jays AAU travel baseball team. Any local organization that wishes to assist can contact Nicole Springer at nspringer@nbbees.com. Any person who donates will receive a voucher to the doubleheader between the Bees and Skeeters on September 8th as well as 10% off a trip with Premier Limousine. A complete and updated list of local businesses supporting the effort, along with a list of donation items requested can be found at NBBEES.com under the community tab. The Bees staff will be collecting monitary donations at each game for the remainder of the regular season. Fans can also text REDCROSS to 90999 to give $10 to support the American Red Cross’ disaster relief efforts in Houston and the surrounding area in Texas affected by the hurricane.